I walk down the narrow basement stairs with ease, but before I can cross the entryway into the warm candlelit temple, the oungan, a male priest in the Haitian Vodou tradition, hands me a ceramic jar filled with water. Pointing to the entryway floor, he motions towards three spaces and asks me to drop water forPapa Legba, the Vodou spirit who grants or denies human access to communicate with any of the Vodou spirits, or lwas. I pour the water. My salute to the gatekeeper had been approved. I enter. “If the spirits aren’t happy they’ll tell me,” he says, smiling slightly. “They’ll tell me what kind of energy you have. Vodou is no spectacle. That’s the primary message I received as an inquiring writer journeying into New York’s tightly-knit, yet surprisingly diverse Vodou community. 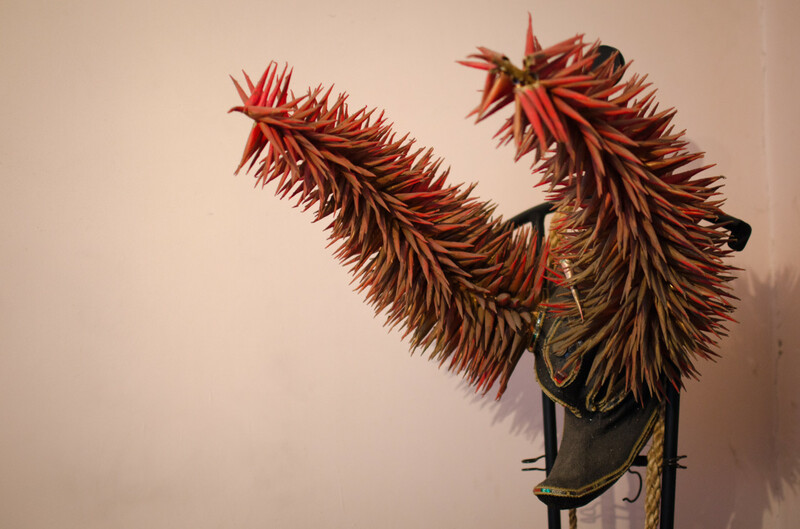 The voyage began in Fort Greene, Brooklyn, at the South Oxford Space arts center, for Verite Sou Tanbou: The Truth about Haitian Vodou. 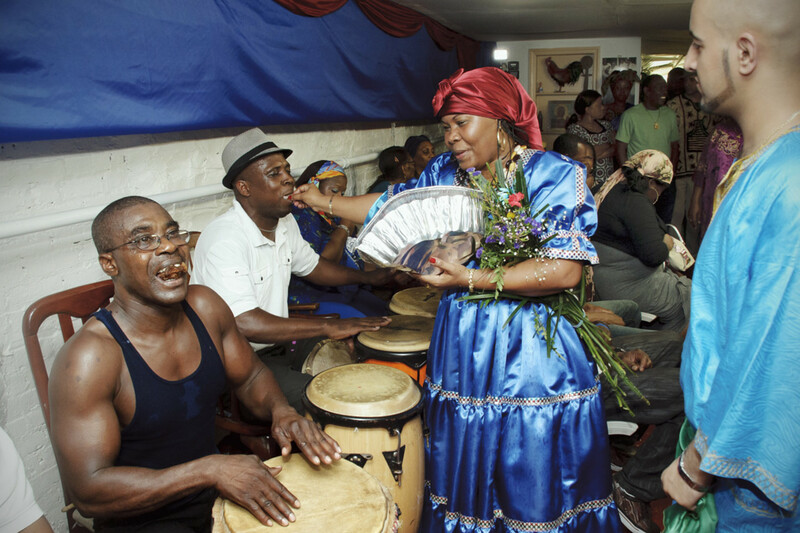 It was the first installment of a three-part series of educational workshops about Vodou. That day, Oungan Dieudonné Jean-Jacques spoke calmly in his native tongue, which was translated for the racially and linguistically diverse attendees who packed the room to capacity. In the crowded hallway, between the moments of silence, attendees whispered amongst each other in Creole, French and English—even a scattering of Spanish. Benin (formerly Dahomey), a slender sliver of a country in West Africa, is widely considered the cradle of Vodou, which came to Haiti (then called Saint-Domingue) in the eighteenth century. Vodouists believe there is one distant God,Bondyè, who is the creator of all things––but they serve a long list of lwasthrough prayer and by presenting offerings, creating devotional objects and altars, and participating in ceremonies brought to life through traditional song, dance, spirit possession and animal sacrifice. Lwas are said to speak with, guide, and offer protection to the faithful on their journey through life. 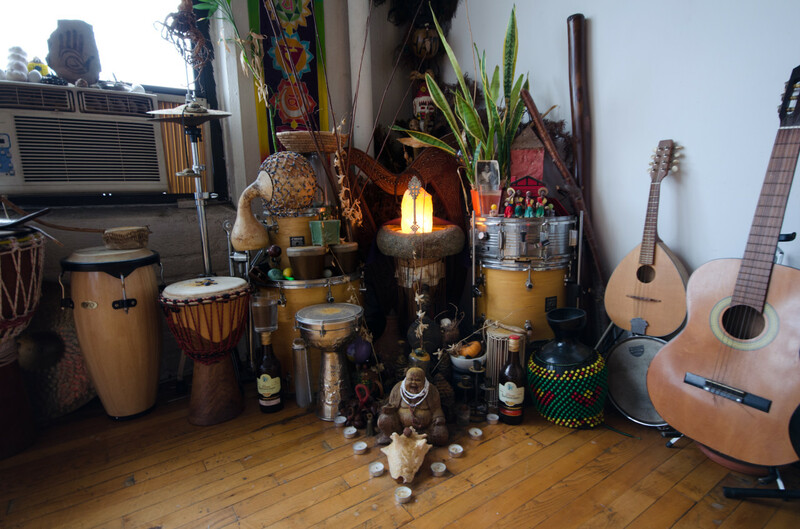 While the Vodou community is constantly expanding to people of various ethnic, social and economic backgrounds, it remains a misunderstood spiritual world and a stigmatized religion. Many Vodouists find themselves constantly trying to set the record straight about a culture they respect and love. Indeed, when I Googled, “what is voodoo?” the first hit describes not an ancient religion but a black religious cult characterized by sorcery and spirit possession. 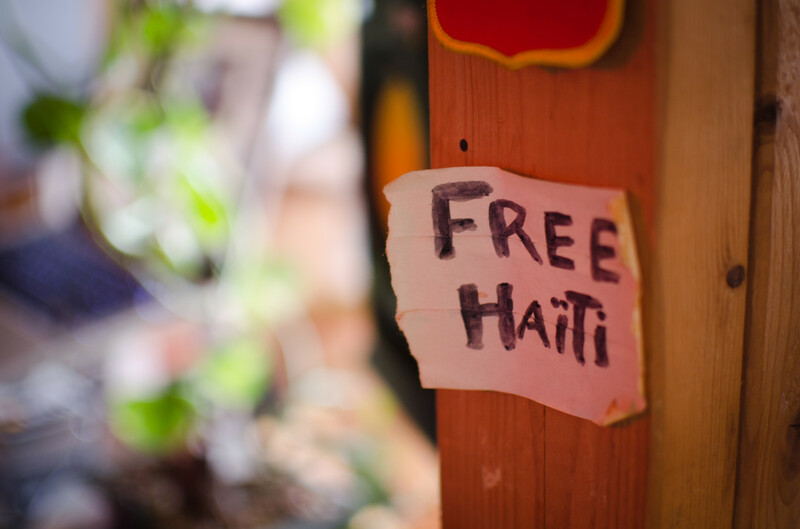 Even in Haiti itself, it wasn’t until 2003 that the country’s Catholic president, Jean-Bertrand Aristide, acknowledged Vodou as one of Haiti’s official religions. 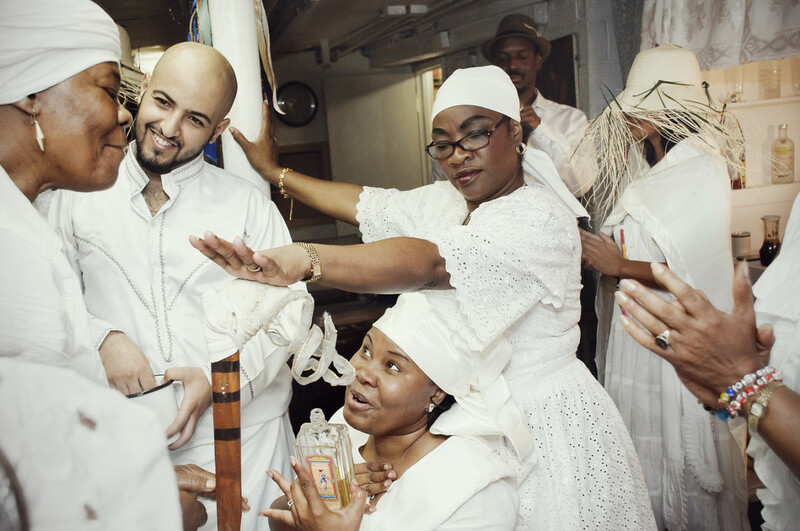 Recently, three New York Vodouists each shared their unique story and deeply personal relationship to the religion: a passionate Haitian-born musician, a priestess and scholar who works to educate the masses about her religion, and a young Arab priest who was unexpectedly summoned by the spirits into the foreign land of Vodou. Perched on an aged leather chair, Val Jeanty rests the back of one hand over her mouth while the other navigates the track pad on her laptop. Her mahogany eyes are alive and focused on the screen in front of her. 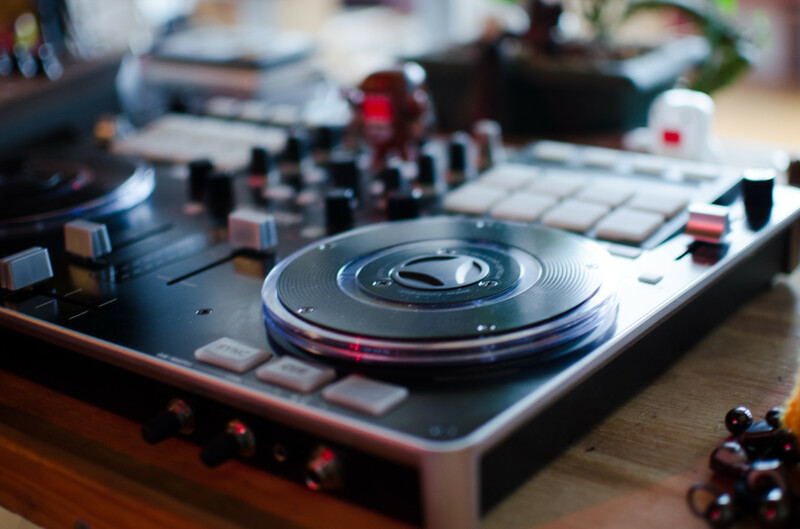 As she adjusts the levels on her soundboard, the beat of drums and unidentifiable instruments pulsate throughout her Bedford-Stuyvesant nook. The rest of the world is clearly silenced for Jeanty, her focus on the music so intense it seems as if her studio has solid, soundproof walls that separate it from the rest of her spacious loft, only it doesn’t. “So how long have you been living here?” I venture. Looking up, she breaks into a wide smile and laughter explodes, her cheek bones reaching for the sky. She’s back. She lowers the music. Jeanty, thirty-eight, is tall and slender, casually clad in army fatigue pants and layered red and black cotton tees. Her amber-toned face is radiant and bare, tiny dark studs rest in her ears, and a black scarf hangs around her neck. Vodou was a natural part of Jeanty’s family and culture growing up in Port-au-Prince, the capital of Haiti. “You know they say, ‘Haitians are 85 percent Catholic, but 100 percent Vodouists,’” she relates, cracking a popular cultural joke. Indeed, many Haitians see no conflict in being both Catholic and Vodouists. Like other ethnic groups in the Americas, they have combined Christian beliefs with distinct traditional practices, and some believe that to be a good Vodouist, you have to be a good Christian. Jeanty’s late grandmother was amambo. Decrying what she considers “the fancy, mystical description,” amambo, says Jeanty, is like a shaman—someone who acts as intermediary between the natural and spiritual worlds. 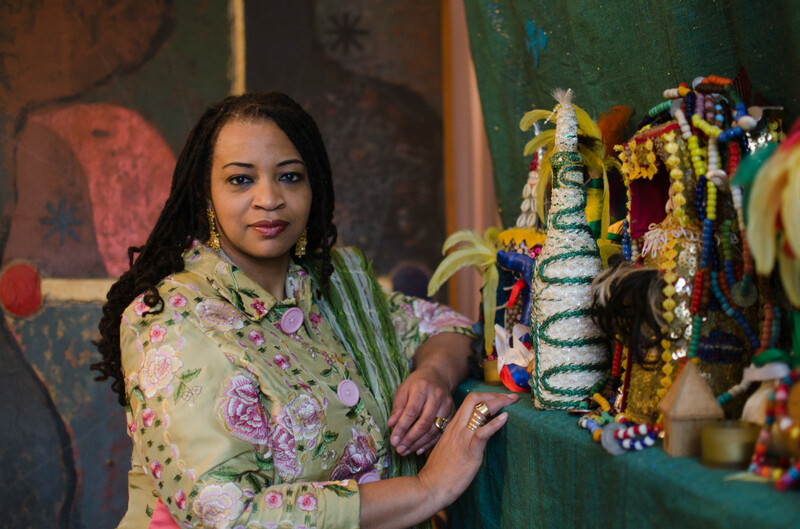 For her, “[Vodou] is more of a way of life, less of a religion.” It’s about listening to the ancestors speak to you and accepting the information they bring. “I was born in the pouch. In Vodou that kid is a special kid…they carry a heavy burden,” says Jeanty, noting that not all Haitian children are born into Vodou, but that those who are tend to stay the course. Jeanty says the Vodou within her was made evident by childhood experiences of unconsciously, yet systematically, rising from bed in the middle of the night and marching across her family’s land to their property gates. From this, her family knew Papa Legba would be a special lwa for her. Described as a small old man dressed in rags who walks with a cane but is particularly powerful, Legba is the chief of crossroads and gates. Jeanty’s routine walk to her family’s gates seemed to be symbolic. In Vodou, certain days of the week are dedicated to particular lwas, which each have distinct personalities and different roles. Some can be quite “feisty,” Jeanty says. “If you’re not connected to certain deities you should stay away,” she laughs. Jeanty doesn’t believe one has to systematically serve all lwas; rather, you naturally navigate towards the ones you connect to. For her, two in particular are important. Jeanty serves Papa Legba on his day, which is Monday, by pouring water at the entryway of her loft. The cleansing element of water clears Jeanty’s home and spiritual passageway so whatever needs to happen in her life can, and will. She also honors Erzulie Dantor on Tuesday by wearing the lwa’s favorite colors of red and black. Known as the Black Madonna for her motherly and protective quality, Erzulie Dantor represents the energy Jeanty naturally has within. Jeanty doesn’t have children but her face lights up when she speaks of her students at The Door, a local organization that serves disconnected youth, where she teaches drum classes, percussion and DJ skills. Jeanty says her Afro-electronica music “is not for commercial use, it’s for the spirit”—and for exposing others to Haitian culture. “I always start with a primitive rhythmic pattern, which is definitely influenced by the Vodou culture.” From there, she improvises, channeling whatever expression she hears and mixing in high-tech digital instruments alongside the traditional Haitian drum. Jeanty’s goal is to use her unique music and positive energy to subtly expose people to Vodou. She has performed at the Whitney Museum and the Museum of Modern Art, and internationally at music festivals in Austria and Switzerland. 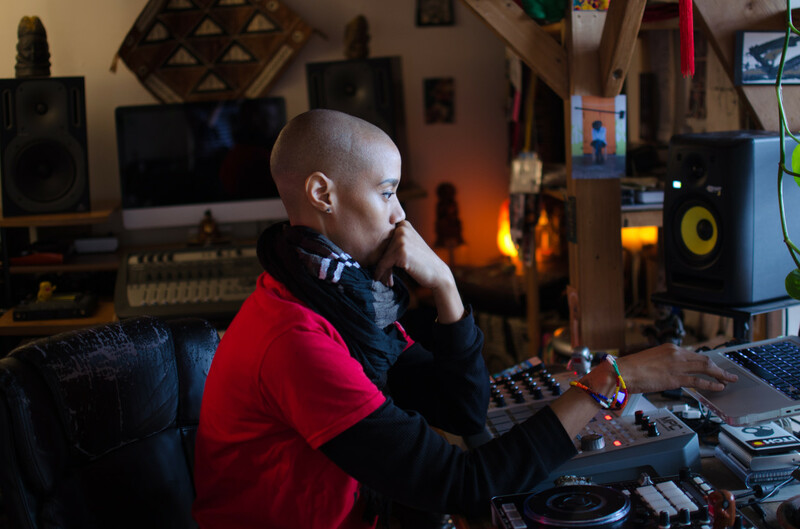 In May, she’ll perform in Poland at the Planete + Doc Film Festival, which will feature The United States of Hoodoo, a documentary in which she speaks about sound and frequency and how they connect the realms of spirituality. While she is not an angry warrior—Jeanty emanates peace as much as the wooden Buddha that sits at the center of her shrine—she is passionate about addressing the misrepresentations of Vodou culture, and boils at the thought of it being used as a commodity. 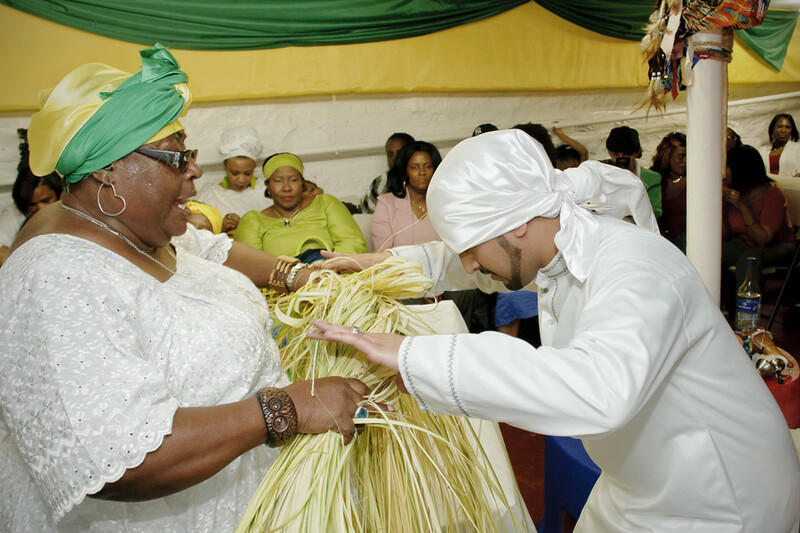 The Internet is a hotbed for Vodou commodification and, in many cases, fraud. She recoils at the fact that one can find a “love potion” or “money spell” online from an “authentic” Haitian mambo as long as you have $129.99 and a PayPal account. The alleged association with evil hexes is what most bothers Jeanty and many other Vodouists. The evil that exists within each of us is real, Jeanty confirms with no hesitation, the question is how individuals—vodouists or not—choose to address this energy. Dowoti Desir’s dark locks, spiraled on the ends, majestically drape beyond her shoulders. Her eyes lower as she looks at the brightly beaded ason she’d removed from her altar, a sacred rattle made from dried gourd that serves as an instrument of power for a Vodou priest. 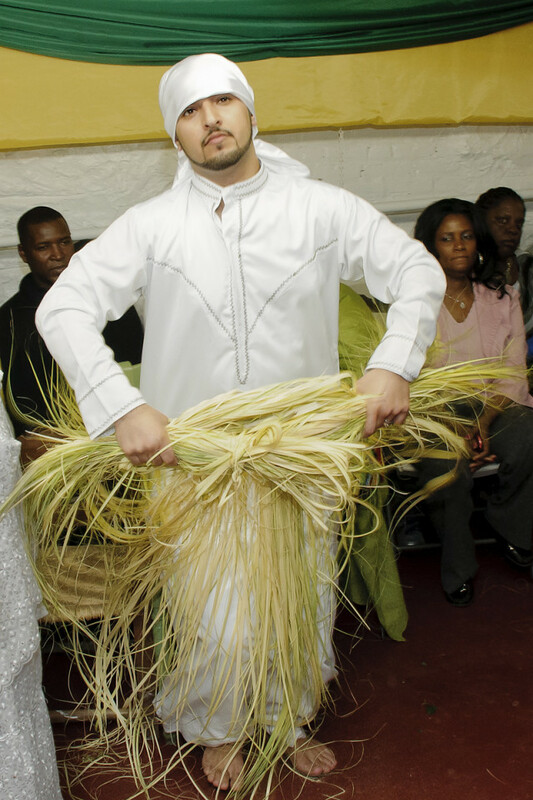 Initiates are “given the ason” to mark the end of their initiation and new title as oungan or mambo. 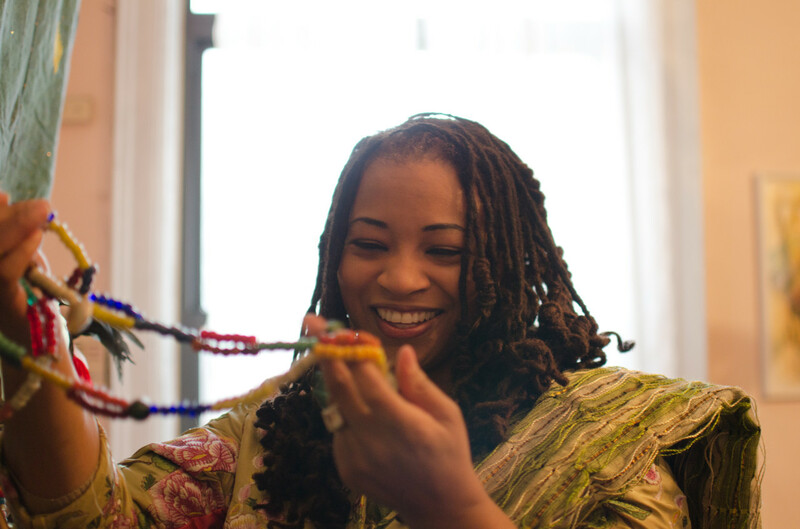 Desir, who was born in Port-au-Prince, says the mere fact that she had to be initiated into Vodou speaks volumes about the way history has affected Africans in the Americas, and why it’s pertinent to preserve a tie to their traditional roots. With the soulful and commanding voice of a natural storyteller, Desir speaks about finding her met-tet—master of one’s head. The met-tet is said to be the most significant lwa to walk with a person on their journey through life. It’s generally the first lwa to possess an individual in ceremony, or the lwa that possesses that individual most often. The met-tet often has characteristics that are parallel to those of the individual. In 1791, a Vodou ceremony was the catalyst that mobilized enslaved Africans to rebel against their French colonial oppressors, sparking the Haitian Revolution, which ultimately led to the liberation of the Haitian people and the foundation of the world’s first independent black republic. 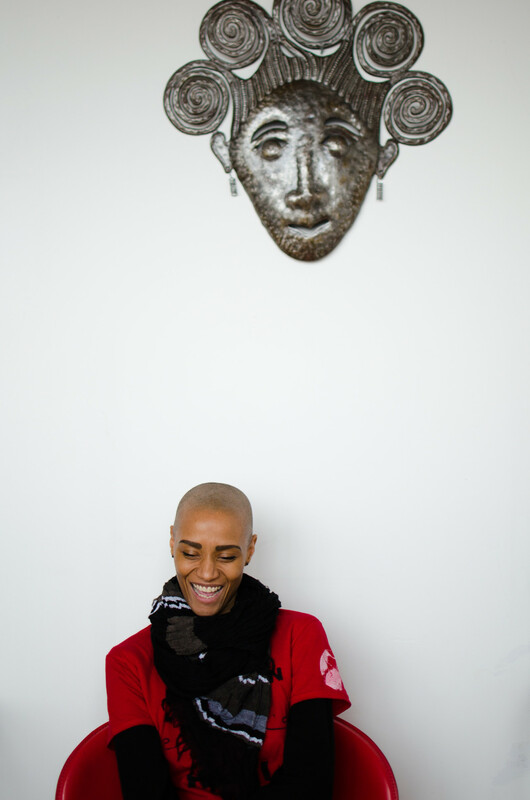 Desir believes the spirit of Vodou she finds present within herself is a gift from both her African lineage and her Haitian heritage. A gold ring with a ruby gem sits above the serpent ring that wraps around Desir’s finger. The dual rings are tributes to her met-tet, Damballa Weddo—the powerful serpent sky god and father of all the lwa—his wife Ayida Weddo, the rainbow serpent, and Ogun, the warrior who always walks with Damballa. It is this commitment to clarifying what Vodou is and is not that has made Desir both an advocate for the tradition and a vocal opponent of those who would muddle its image, particularly people who equate Vodou with devil worship. “There is a problem of straight up Afrophobia,” says Desir—a problem we must continue to work on, she adds. Desir’s organization pushes for public policies in support of this struggle, and advocates for financial reparations. It has been suggested that part of the problem of Vodou’s image is that it doesn’t have a go-to “holy book” that could clarify any misconceptions or outline the principles. On a recent Sunday evening when the freezing cold choked the life out of usually boisterous Flatbush Avenue, retreating to a warm subterranean space was a delight. The scent of roasting pineapple wafted by as Oungan Amer Ahmed and I sat chair-width apart to discuss his peculiar path into Haitian Vodou. Ahmed’s demeanor is welcoming, his voice calm, his smile inviting, his chestnut eyes piercing. Ahmed was exhausted – he’d just hosted a spiritual client for a full week. She had a “zombie in her body,” and he and his spiritual mother “did the work.” Being an oungan is hard work and takes a toll on the body, he says. Ahmed takes Sunday off from healing whenever possible. He is joyous and ready to talk about the entry to the spiritual world he loves. Sliding his index finger across an iPad screen, Ahmed swiped through images of the many ceremonies hosted in this converted basement, which serves as a temple. In one photo, wearing a gold trimmed teal boubou (traditional African robe), Ahmed’s youthful chai-toned skin seems to glow under the light as he watches his spirit mom—the woman who gave him his “new life” in Haitian Vodou and guides him through his journey—possessed by Erzulie Dantor. Clad in a full-length indigo dress, her tresses resting under a maroon head wrap, she lovingly serves her favorite food, griot (a fried pork dish) to a line of drummers, who open their mouths without missing a beat on the drums. In other photos, the woman appears wide-eyed while Ahmed helps her to stand up. As a pre-teen, Ahmed came to the United States from the Middle East (he does not wish to share which country). Initially settling in Bay Ridge, Brooklyn, his family later purchased a home in Canarsie, a predominately Caribbean neighborhood also in Brooklyn. “I used to be sick,” he recalls, tying a red scarf around his head. Ahmed, now twenty-nine, was known as a child for his sporadic bouts of unconsciousness, during which he would aimlessly roam the streets for varying amounts of time. When he came to, he often had no recollection of where he was or how he’d arrived there. His parents were worried, and his behavior incited curious stares and whispers in his small Muslim hometown. “There were moments when I would talk to myself,” he said, stroking his goatee. The solo conversations were enough to disturb his parents, but more alarming was the fact that he was speaking a language they couldn’t understand. Thinking he was either using drugs or possessed by an evil spirit, they took him to the mosque for an exorcism. That exorcism didn’t seem to work, he says, although before long the bouts of unconsciousness ceased and Ahmed went back to being himself again. It would be years before he experienced such symptoms again, but the voice in his head never stopped. As Ahmed tells it, that voice was what ultimately led him to his current spiritual path. It wasn’t until his school days in Flatbush, Brooklyn, where he had many Haitian classmates, that Ahmed says he realized the voice in his head was speaking to him in Haitian Creole. His friends found it strange, but cool that he could speak their language, recalls Ahmed, and affectionately nicknamed him Ti Blanc – little white boy – in Creole. Four years ago, he once again experienced the same unexplained roaming of his childhood, this time accompanied by excruciating headaches. Six weeks of Ahmed’s problems with no answers was more than enough for his parents to admit him to Kings County Hospital for a three-day psychiatric evaluation. “They thought I was going psycho. They wanted to know if I [had] my mind,” says Ahmed. “The ancestors of that language want you to come to them,” the man continued. “Oh no, I am not going to do that,” he said, shaking his head. Yet he was intrigued. He had to know if they could help. So Ahmed lit a candle and asked the Haitian ancestors for guidance. He didn’t hear anything the first week, but then one night, a song came to him in a dream and he saw a serpent, which spoke to him, saying: “I am Damballa Weddo.” It was only later that he connected that vision to the serpent lwa. “I’m going to show you who is going to help you,” Ahmed says Damballa told him. “This woman is going to be your mother and give you a better life.” The lwainstructed Ahmed to go to St. Patrick’s Cathedral in Manhattan, where he would meet a lady. Ahmed acquiesced. “I wanted to meet this miracle lady,” he says, seemingly still in awe. Ahmed visited the church several times over the course of a few weeks. “On the third week, when I got up to leave, I saw this woman.” Clutching his belly, he says, “I got this butterfly feeling in my stomach.” It turned out the woman attended St. Patrick’s Cathedral and was also a Haitian Vodou priestess. Ahmed explained his dream to the mambo. He said their energies immediately clicked and they began forming a spiritual connection. She began telling him about Vodou. Ahmed entered a secretive seven-day initiation, partly in New York and partly in Haiti; oath-bound secrets prevent him from divulging exactly what happened. 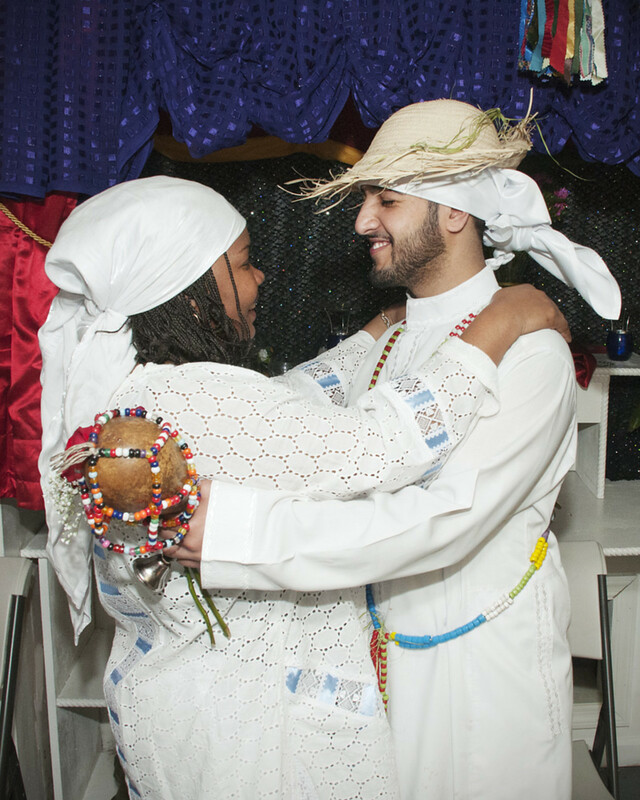 Under the tutelage of his new spirit mom, Ahmed started regleman, the process for learning the culture and practice of Vodou, including the rituals and the many lwas. “Your body, your energy travels to the ancestors. You are re-born,” he says, shaking his head intently. The ailments that plagued Ahmed prior to initiation have since dissipated. “I came to Vodou for my own healing,” he says, but insists, “I didn’t choose. The spirit chose me. Why they chose me, I’ll have to call the spirit and let you ask them,” he says, laughing. Three years after his initiation, Ahmed is an active oungan with several clients and three spiritual children (those who he initiated.) He says he’s been called to the highest level of priesthood, which is asogwe, his current title. He reads dreams, creates protections, reverses spells and provides other healings. “I love to do magic,” he confirms, noting that he particularly likes “love magic.” If you want to re-connect with an estranged family member or resurrect a flailing relationship, Ahmed says he can help, and ensures he is not one of the con artists Jeanty cautions against.